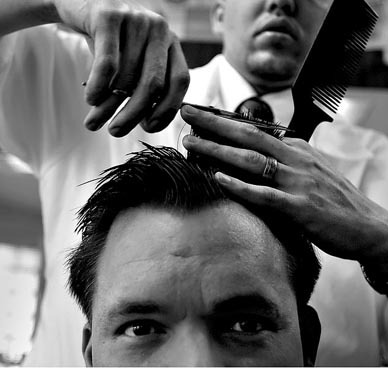 On haircuts and fundamentalism | Transformational thoughts…. ← Prayer for Christian disciples. An excellent piece from one of my mates……. Like many words, “fundamentalist” can be a slippery one. At the turn of the 20th century in the United States, the word was made popular by a series of books called The Fundamentals, a 1910 work including 90 essays outlining orthodox Christian teaching. In recent years, however, the term has come to represent more an attitude than a doctrinal stance. Fundamentalists are those who seem focused on why they are “in” and others are “out.” It is a combative approach that emphasizes doctrinal purity over loving God and neighbor. Nothing crystallized this sour-faced, narrow approach to religion better than our Gospel concert at the Temple. (The name of the church has been changed). My family was a Gaither rip-off, “The Croffords: Musical Messages with Warmth and Love.” Our high water mark was in ’75/’76 when my dad, mom, my five brothers and I recorded albums at Pinebrook in Alexandria, Indiana, the studio owned by Bill and Gloria Gaither. Usually we sang only on weekends, but this was at the time of Jerry Falwell’s “Moral Majority.” A meeting of pastors was being held during the week at the Temple, and – not knowing the political agenda – my dad agreed for us to come and present a mini-concert for those gathered. We pulled out all the stops. Dad took off work, as did my oldest brother. Very exceptionally, my parents released us from school a few hours early that day so we could perform. Before the concert, we had changed into our outfits in the men’s room and had to step around a barber chair. Yes, they were giving haircuts in the men’s room of the church! That was odd, to say the least. Now this was the day of polyester leisure suits, extended sideburns, and (for boys of any age) long hair. After the concert, we were packing up the sound equipment when one of the men from the local church came up to talk to my dad. “See those sons of yours?” (He pointed to two of my little brothers, aged 6 and 7 at the time). “You really need to get their hair cut. They look like girls. Don’t you know that the Bible says that ‘It’s a shame to a man to have long hair’”? That story happened 37 years ago, yet in some quarters, little has changed. There are still groups of sour-faced fundamentalists in churches whose mission is finding fault with other believers. They criticize professors who try to clothe the gospel in terms that will resonate with the current generation, even though the essence of the timeless Gospel message they present remains unchanged. Rather than penetrating the culture in winsome ways, sending out our young people to change the world, fundamentalism is the “pull up the drawbridge” mentality. It is always “us” vs. “them.” It has forgotten that the most effective evangelism is not hiking up the hems of our holy robes so as not to be sullied by the “world.” Rather, it is finding areas of common humanity with all people, then using these to build relationships with those who so desperately need Jesus. If all we ever read are Christian novels, listen only to Christian music, and limit ourselves to “churchy” things, what springboards for conversation will we have with those who have no interest in all that? Can’t do the “Harlem Shake” – that’s demonic. Can’t listen to this music, or that. And then we’re surprised when we’re unable to sustain a 5 minute conversation with a non-Christian? In the Garden of Eden, God told Adam and Eve that they could eat of any of the many trees in the garden, except one (Gen. 2:16-17). So why are we hanging “don’t touch” signs on so many trees, wholesome activities that God has made for our enjoyment? There was a time when I was ready to do battle over a long list of things. Maybe it’s just that I’m growing older and realize that life is only so long, but my list of “non-negotiables” has gotten a lot shorter. Yes, there are things we should avoid. Some activities are not wholesome and – if persisted in – will begin to cut off our relationship with God. But we should be careful in our world that has lost its sense of moral direction not to over-react, erring in the opposite direction, placing out-of-bounds many of the good things God intended for our benefit. “Finally, brothers, whatever is true, whatever is noble, whatever is right, whatever is pure, whatever is lovely, whatever is admirable–if anything is excellent or praiseworthy–think about such things”(Phil. 4:8, NIV). What an amazing world God has gifted to us! Let’s shake off the fault-finding, narrow spirit of fundamentalism. Let’s turn our young people loose; let’s send them out to affirm all that is good in God’s creation, modeling a wholesome life centered around loving an incredible Saviour, a love that can’t help but love others. Now that’s Good News! This entry was posted in Christianity, Church, Culture, Dysfunctional, Evangelical, Fundamentalism, Grace. Bookmark the permalink.